Has the last surprise been revealed? Looks like we won't be waiting long. The latest in an ever growing list of leaks about Samsung's upcoming midrange smartphone, the Galaxy A5, has revealed that we should be getting our hands on it surprisingly early with the handset going on sale in November. 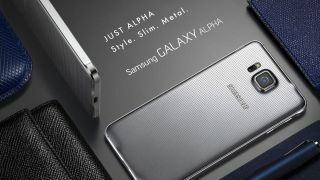 We already know a lot about the rumoured Samsung Galaxy A5 thanks to a series of leaks, such as the fact that it will share the same unibody design as the Samsung Galaxy Alpha. We've also seen detailed information about the specifications of the A5, including benchmark results that suggest it will run a 64-bit Snapdragon 410 processor. With the Galaxy A5 release date now seemingly out in the open thanks to a SamMobile source, it looks like we won't have too long to wait to see just how accurate these many leaks have been. The latest rumours also contained information about the similarly-leaky Samsung Galaxy A7. Previous leaks suggested that the A7's screen size would be 5.5-inch. The same SamMobile source also had another detail about the A7's display - in China it will apparently come with a full HD display. Whether this resolution will be present in other countries when the A7 is launched has not been disclosed, but there's a good chance that the information will leak eventually.